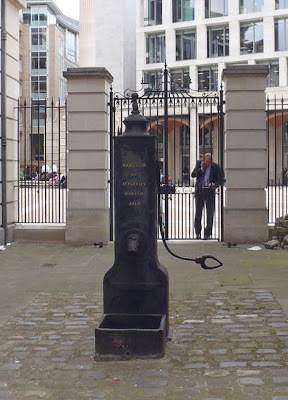 Though the Church of St Faith has not existed for hundreds of years, St Faith's parish pump, dated 1819, still stands stranded by a fence between Paternoster Sq and St Paul’s Churchyard. The history of the parish of St Faith's is an interesting one. The original parish church of St Faith stood on the north side of Old St Paul’s until the 1250s, when we are told that it was demolished as part of work on the cathedral. From the 1250s until the reign of Edward VI, the parish known as St Faith under St Paul's literally worshiped beneath St Paul's Cathedral, using a space the end of the west crypt under St Paul’s Quire. After this date the parish was united with St Augustine Watling Street. The pump was once situated against railings of St Paul's Churchyard close to St Paul's Cross, but was moved to its present position in 1973.